The origin of the poem’s name is a bit disputed, but most people believe it comes from the Irish city of Limerick. With just fine lines, the first two rhyming with the fifth line, and third and fourth lines rhyming together, limericks are quick, funny poems. Although popularized by Lear, limericks first started to emerge in England in the 18th century. Most limericks begin by describing a person and place, and then the rest of the lines describe that person’s actions. Limericks can be vulgar or crude, and are often inappropriate. Lear liked it that way—he considered “clean” limericks to be average at best. More recent limericks have turned toward current events and social issues. The zanier, the better. Get together with a group of friends to see who can come up with the funniest, most nonsensical five-liner to pay homage to Edward Lear. When you come up with your best draft, make sure to share it with the world using #nationallimerickday. You could become a famous poet! Or, at the very least, get a retweet or two! Try your hand at the limerick five lines, and then expand to other types of poetry. A sonnet is a rhyming poem with 14-lines, while a free verse poem doesn’t have any rules and lets the writer play around with lines, rhyming, and even punctuation. Many libraries offer community writing classes, along with city recreation centers. Check one out and get creative! Only the most bold of limerick lovers will take this option. 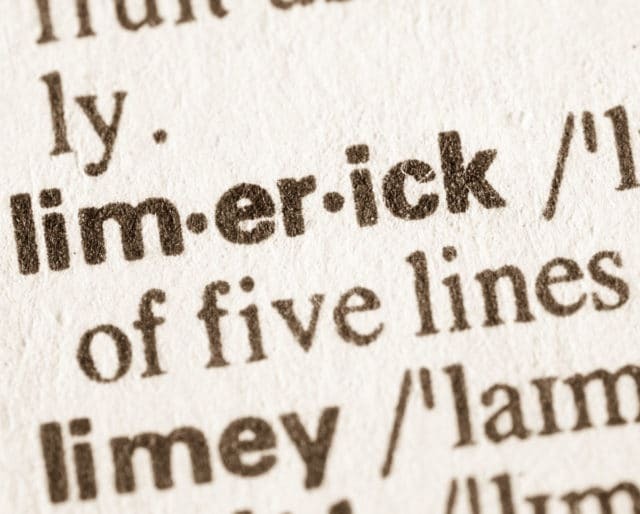 Book a flight to the poem’s country namesake, and spend some time in the land of Limerick! Take a boat tour along the River Shannon and visit St. John’s Cathedral. Visit the People’s Park and then stop by the Hunt Museum, where you can see original works from Picasso and Leonardo da Vinci. Limericks are short and easy to write. It’s a great way to put pen to paper and bust out a few poems! Think up kooky characters and situations, and put them together in a quick poem. Impress your friends by writing a couple and see which ones they like best! Not everyone loves poetry. Some can be hard to understand, or a little too humorless and emotional. Limericks offer a fun way to still be poetic, without taking themselves too seriously. Not every poem has to be 100 lines long without any rhyming. Limericks live a little and make you laugh!